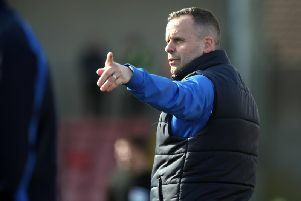 Josh Carson is predicting an enthralling encounter when the top two in the Danske Bank Premiership meet at Seaview tonight. Coleraine know a win would see them leapfrog Crusaders at the summit. Bannsiders’ midfielder Carson is hoping they can heap more title disappointment on the Crues after what happened last season. “Crusaders are a fantastic team,” said Carson. “Everyone has seen that over the last few years. They have won numerous trophies and are a real force in this league. “It will be a very competitive game. They will obviously be out to put things right after what happened to them last year. “But we would love to go on and sicken them again this season. “Whatever happens on the day, it will be a fantastic football match. “They are all big games at this stage of the season. “We are looking forward to it, and taking it in our stride. What will be will be come the end of the season, but we have a crucial five games coming up now. “When you lie in bed at night you do think about the end goal. You can only dream about things like this, especially about the football club, it would be a momentous occasion for us. Coleraine still have the chance to complete a League and Cup double following their semi final win over Larne on Saturday. But all talk of the ‘Double’ has been played down by boss Oran Kearney. “We would be in dreamland if we could go and produce something like that,” he said after Saturday’s win. “But honestly, Crusaders haven’t come into my mind until after today’s game, because that’s how we deal with things. “It’s worked well for us all season, we just take care of what’s in front of our nose. “I’m in football long enough to fully understand the moment you start to get ahead of yourself it’s very quick to clip your wings.